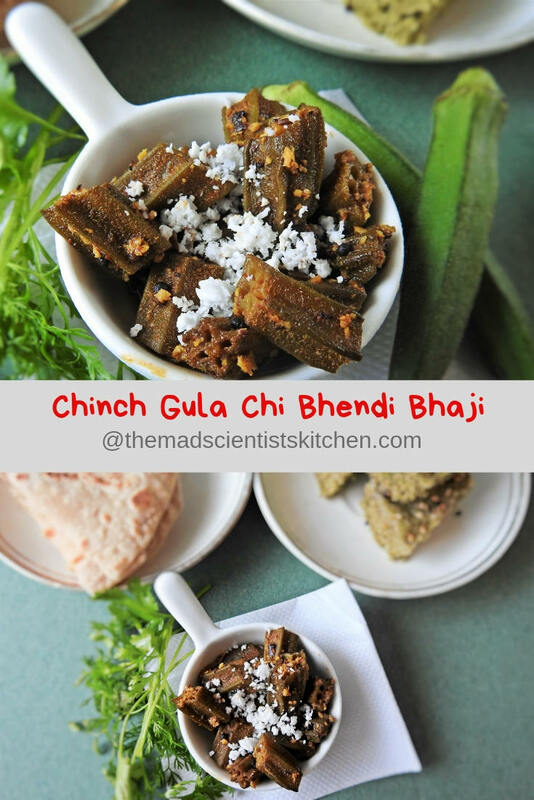 Chinch Gula Chi Bhendi Bhaji translates Lady Finger vegetable with tamarind and jaggery and is a tangy, sweet yet pungent offering from the state of Maharashtra. This vegetable has a unique place in my memory as this was one of the first vegetables I learnt to cook after marriage. In my mother’s place, we made the stir-fried vegetable with bhendi( OMG I have not blogged it???) Bhendi fry, Bhendi Bhaji or much later Amma made Pepper Bhindi. So this was a totally different ball game for me. I loved to add a lot of water then tamarind in my typical South Indian fashion and neglected to add the jaggery in the vegetable because I never did enjoy the combination of sweet and sour. Not at all a done thing in my new home their food was sweet. Needless to say, I tried cooking what was needed by the rest, never enjoyed my food and resented it hardly ate. The result was I lost weight like anything from 44 kgs I came down to about 28-30 kgs. Being tall I was totally underweight and used to be dizzy all the time. It was only later when the doctor spoke to me, told me to eat something I prefer if not at home outside I became better. Now I enjoy these sweet-sour taste but still do not want my dal or vegetable on the sweet side. Why am I taking you on a nostalgia trip?? This month for Ssshhh…. Secretly Cooking we are exploring Maharashtra! In case you do not know we are a group of bloggers who blog on a theme. We are paired and we share ingredients. The 2 ingredients star in our dish for the state chosen. So for this month, my partner is Sujata Shukla. Sujata has an amazing place called PepperOnPizza do check out her recipes the one I have my eye is Roasted beetroot hummus to begin with then recently she has blogged Spanish Romesco Sauce. There are others that I had bookmarked but then my laptop was reformatted and all of them are gone. ( Learn at least now Archana, tu nahi sudregi). Anyway, Sujata gave me tamarind and salt as my secret ingredients. I tried 2 recipes one was rejected this one was acceptable. I gave Sujata the commonest of ingredients oil and chilli and Sujata came up with this delicious and famous Maharashtrian Amti with Goda masala and kokum . The other Maharashtrian dish you can make with tamarind and salt combo are Alu Vadi or Taro Leaf Roll, Amti/ Tur Dal Amti/ Toor Dal Amti, Dal Dhokli| Stew of Dal and Wheat Flour Noodles, Tamarind Chutney, Black and White Wednesday and Vada Pav~~ A Blog Hop #8. With kokum, you can try making Mushroom and Fried Banana Sticks in a Kokum Sauce, Kokum Sherbet / Binna Sherbet, Sol Kadi, Futi Kadi. Wash the ladyfingers and pat them dry. Usually, I do this in the night and keep them wrapped in a kitchen towel. I used to clean them with kitchen towels but my maid prefers this method. Cut them in bite-sized rings. The small the rings faster they cook. The size mine are cut it takes longer to cook but then they hold shape too which is very important in my family. Soak tamarind in water squeeze out the pulp and set aside. Heat a kadhai/wok with oil. Add the mustard seeds once they crackle add the jeera, hing, turmeric. Add the ladyfinger rings and sauté for a few minutes. The lady finger will change colour a little. Add tamarind juice, salt, cover and cook for about 10 minutes or until ladyfinger cooks nicely. Add water if needed. Once the ladyfinger is done add jaggery, Goda masala, and Peanuts powder (if using). Boil for a minute or 2. For Goda Masala check here. We make this lil more graver n fav of all.. But now ur pic tempting me to try this way very yummy ???? 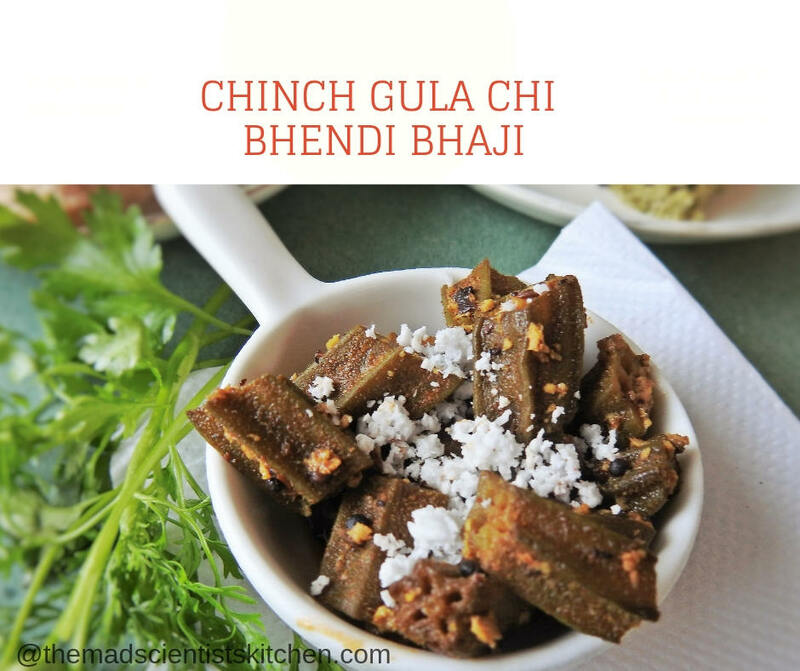 Delicious bhendi bhaji, am sure this dish is definitely a flavourful one to enjoy with some rotis. Goda masala addition sounds too good. While the recipe is lovely and I love lady finger with a tangy kick to it, I loved loved reading your story. Gosh Archana dropping so much of weight! That was really scary! 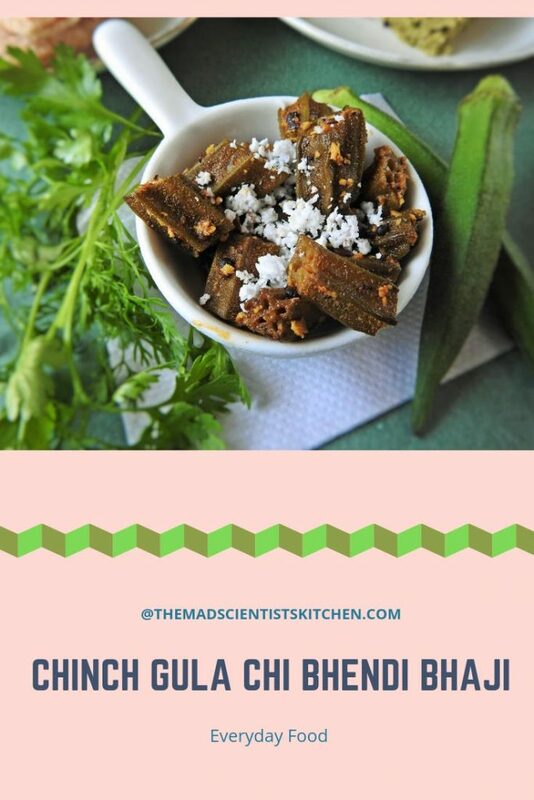 This will be a welcome change to the Bhindi fry that is a staple in my home, though the Andhra Bendakaya Pulusu is something similar though more watery. True Aruna we forget that every day is delicious too. Thanks, dear. Bhendi bhaji looks so inviting. Crushed peanut definitely give a crunch. Bookmarking it to try soon. Superb share. This dish has such an interesting name. I liked the way this dry sabzi has turned out and I am sure it will be delicious too. you can make it with gravy too, Anu. Adjust the consistency. :D Enjoy. It’s amazing to see the same humble veggies cooked so differently in various Cuisines. Loved this spicy preparation. 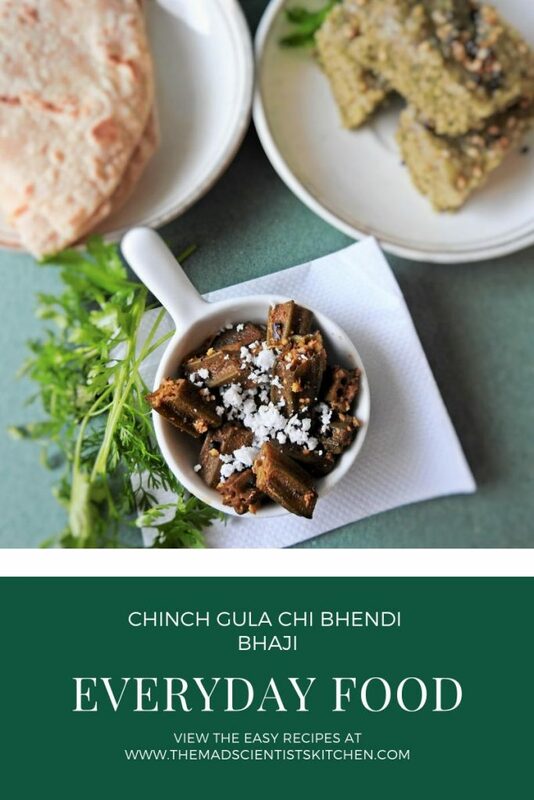 Bhindi stirfry looks so delicious, adding peanut powder to every dish makes this cuisine distinct…..
Love bhendi and I have another variety to make. It looks so tasty. Love this recipe.. Super inviting and feel like having now. 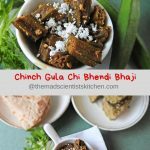 We love Bhendi, and this mildly sweet and tangy version would be a flavorful variation to my stir fry and bharva bhendi. Thanks for the share di. 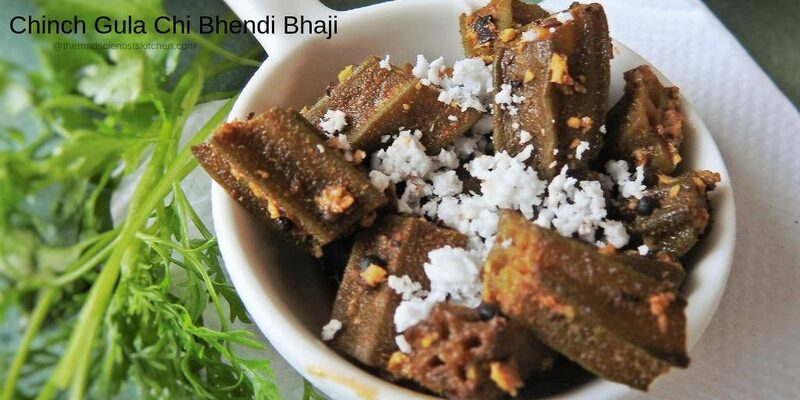 Bhindi Subzi with tamarind and peanut powder, it must taste totally different to to plain haldi namak stir fry I prepare and of course, delicious! It was fun partnering you in this months challenge! Enjoyed reading your story, Archana, but oh my! Losing weight so drastically! Im glad the doc was able to pinpoint what went wrong and how to get yourself back in shape. Sujata thanks! I really enjoyed our conversations and partnering with you was a pleasure. it took a while for me to pronounce this correctly and tried it today at my mil’s. She is a hard critic, but nodded for this, yeahhhhh!!! I guess she likes it a lot. 😀 That is an achievement Seema getting MIL’s approval. I am glad I was a small part of it. Enjoy!